I think this poster would smell of sweet fruity candies and champagne. It gives me a feeling of a grand party of young and hip individuals that are networking or socializing with a purpose in mind rather it be dating, or broadening their social horizons. The elements of the poster would move in bouncing like fashion making contact with one another in a randomized fashion. The colours are very loud from the top down into the center of the poster and then is disturbed by silent black plans that seem to interrupt and silence the energy in the piece. If I were to put this piece into the medium of music I would envision a jazzy swing music with a storm trumpet lead that uses sufficient amount of vibrato in its long notes. This piece to me translates well into the note of the trumpet because it is very loud and boisterous, each colour is very distinctly separate from each other, similar to the notes played by a trumpet. When did you first acquire your interest in the field of design or graphic design to be more specific? Paula: During the year of 1970 I had moved to the big city of New York in my early 20’s to become a graphic designer. 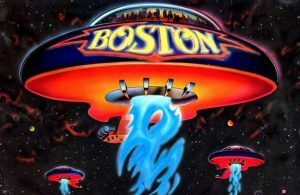 I ended up landing a job where I would be designing album covers, such as the iconic Boston’s eponymous album of 1976. I had also owned and ran my own business for several years. I was originally from Washington, DC and attended schooling in the Philadelphia area. What was your experience like moving to a large city and working with the huge corporate establishments of New York and their identities? Paula: To successfully integrate yourself and your work into a new and large environment you need to study and deeply understand the audiences you are designing for as well as their demands and expectations. Simultaneously you need to grasp the identity and the output of each organization’s desired aesthetic and how they wish to be perceived by those audiences. You’re creating essentially a type of visual language to communicate the organizations inner fundamentals in the way that they want those on the outside to apprehend. Do you have any specific experiences that you strongly relate to your theory? Paula: Each organization has a specific and well-known identity. This is a key part to design communication in the industry in order to be recognized for even a small icon. One instance that comes to the forefront of my mind is when I designing the logo for the Metropolitan Opera, is was more specifically designed solely because the ‘Met’ had lost its name to the museum of Art for commercial reason such as branding on products and such which would then say “THE MET”, the audience of New York became to associate the met with the Metropolitan Museum of Art, rather than with The Metropolitan Opera. When designing and working with such a large scaled client such as the Metropolitan Opera, how much is in collaboration/ how involved is the corporation with the design itself, or are you given the ability to design under your own discretion? Paula: In general, being a designer and working with a client(s) it is much more of a ‘intimate’ relationship in the sense of business affairs. You must learn and know as much about them as you can possibly learn before you start designing their piece(s). You need to understand who (the corporation) is and how they came to be where they are. You need to have a good understanding of their history. You must not only immerse yourself into what they are, but also what they are not, what they have done wrong, or faults in their history. After you have immersed yourself in learning all about this corporation you then must understand their audience, the people that they will be communicating with and to. Depending of the organization, you will be given more or less creative freedom. When dealing with and ever evolving city such as New York itself, a place that is constantly changing its branding practices and aesthetics, how does that affect the way in which you design? Paula: My goal and I believe that it is also the goal of various other designers is to create something that is not only going to standout when first released into the world, but also creating something that will essentially last for a long period of time. Is there any specific works that you used that goal/theory on? 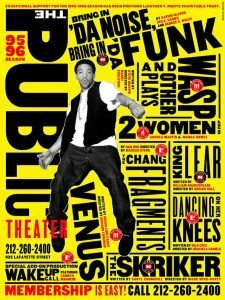 Paula: An example of this would be the various posters and identity I created for the Public theatre beginning in the year of 1994. I still have a continuing work relationship with them and as a joint effort we have evolved the identity and applied changes to the various posters and advertisements. It is pretty much the exact same identity I had initially designed. In the concept of creating designs that not only serve effectively for the present time but as well as lasting for many years to come, how would one be able to design something of that nature? Paula: It is not just to create a singular piece that will be effective for a long period of time, it is more the concept of creating a strong and recognizable identity. When designing a logo you must find the perfect balance between an original eye-catching design so that they are recognizable, while remaining simplistic enough to be used constantly and in a vast amount of contexts/medias. “Oskar Schlemmer, utopia 1921.” Pg 217-219 Graphic Design A New History, Stephen F. Eskilson. These works share the aesthetic of the Suprematist movement. Pictured on the left is Kazimir Malevich’s Supremus No. 58 (1878). 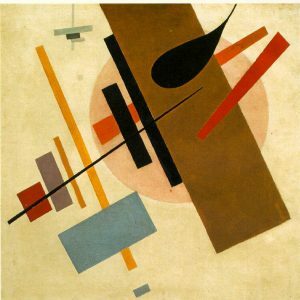 This work represents the “grammar” of the suprematist’s, based on its rudimentary geometric forms (including organic) such as the square and the circle. Much of the works created out of this movement was focused on those basic forms as well as the integration of linear work and rectangles. The works were often done with a limited range of colours. The concept behind Suprematism was to create works that were solely based on feeling instead of rigorously depiction an object or idea. The second work picture on the right is Oskar Schlemmer’s Utopia (1921) which was created from the Weimar Bauhaus movement that was correlated with the Expressionist movement as well. 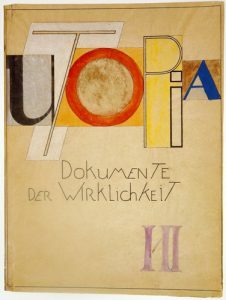 The title of this piece aired to the Bauhaus goal to make the idea of a utopian muse to be recognized as a social reality. 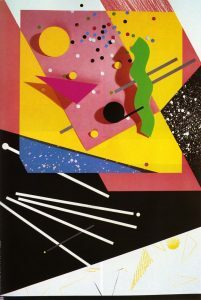 The lettering and shapes surrounding resemble that of Malevich’s works, along with the colour range. Unapologetically testing preconceived artistic social standards.